Use Circles (point #3) to segment your customers based on demographics. Editor’s note: My favorite description about Google+ was at SEOmoz‘s 2011 MOZcon conference, where Kristy Bolsinger referred to it as a 3rd sock. “I already have 2 good socks (Twitter and Facebook) – I don’t need another one!”. I’m starting to come around though and see that it’s going to finally be the Google app that helps shape the social web’s future. So listen up and get on board. Quickly. When Google unveiled brand pages on its Google+ social network, detractors argued that Google+ will never compete with Facebook, but it’s showing that it can offer a serious alternative social channel to share content, build links and connect with customers. 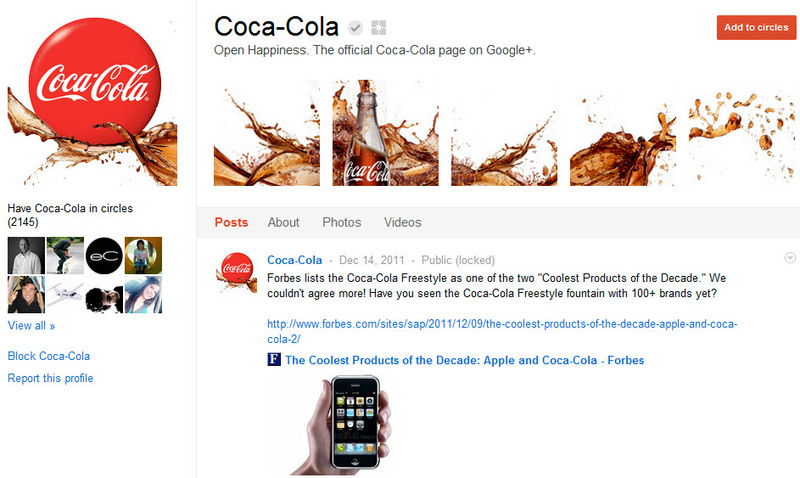 Mashable’s roundup of the top ten Google+ brand pages is a good place to search for inspiration. If you’re not convinced of the importance of early adoption, the article points out that Coca-Cola, a brand with one of the largest Facebook followings, was slow to create its Google+ brand page. America’s favorite cola has since stepped up with its own brand page, but it lagged behind competitors in building an audience on Google+. 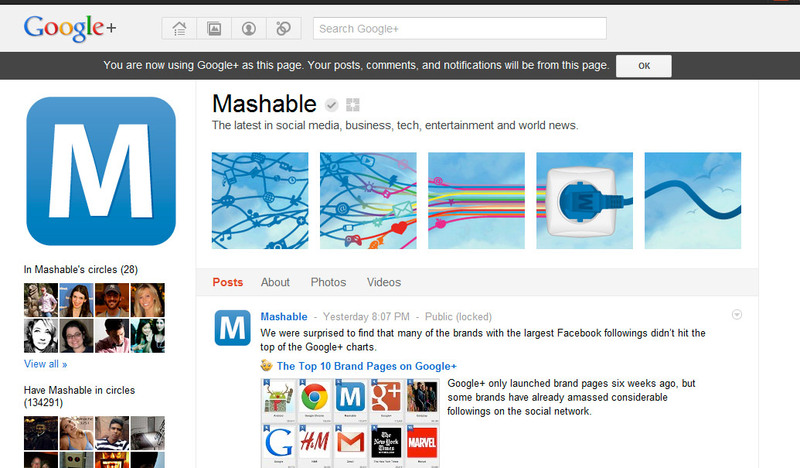 Google+ is offering some cool analytics features that allow brands to quickly see how viral their content is. For example, you can check out the “Ripple” effect to view who is sharing your content, how influential they are and who is in their network. Once you’ve identified influencers who are sharing your stuff, you can add them to your own circles and start communicating with them. Quickly share your brand page with anyone in your network (including email contacts), even if they don’t have a Google+ account. Code (to embed in your website) that connects your business website to your Google+ brand page, even including analytics illustrating the relationship between the two. Creative kit to help you move photos and images from your profile to your brand page, so you can easily spice up your page. Pages can’t add people until a person adds a page first. Pages can’t share to extended circles. The plus-one button appears on brand pages automatically, and it’s a quick and painless way for customers and prospects to recommend your business. How much easier can it get than a simple click? To maximize your results, encourage customers to plus-one your page or your website. You can go so far as to offer them a discount or free product if they do so. Even better: If you’ve written an extremely popular blog post that earns hundreds of +1s, Google search users can quickly see the popularity of the article and are more apt to click on your link. The +1 button also appears in Google Search Engine Results Pages (SERPs), meaning that any internet user can immediately give your website, blog or social profile a thumbs-up with a single click. SEODesk.org reports that Google has confirmed that the plus-one button will affect search rankings. How, exactly, is up for interpretation. According to the article, Google execs will be analyzing plus-one usage and how it’s impacting website rankings, but it’s safe to assume that the more plus-ones your website has, the more your readers are indicating that your content is useful: A key indicator for Google as it seeks to show the most relevant and helpful results. Finally, you’ll want to add the plus-one button alongside your other social sharing buttons that appear on static web pages and blog posts. You can do this easily using a free service such as AddThis, or you can get the code directly from Google and insert it into a WordPress widget area or anywhere on your site you want it to appear. Circles are a convenient way to organize contacts by interest or other segment. For marketers, this is a highly effective way to target messages that are geared to specific consumer groups. For example, if your business offers multiple products or services, you can send a message or announcement to those contacts who have expressed an interest in a certain area, without alienating those that are interested in other aspects of your service. Any search on Google+ will reveal that images are extremely popular. Images, such as infographics, are user-friendly because they convey complex information in an easy-to-understand format. Who wants to read 2,000 words when a quick glance at a graphic will provide the same level of understanding? One useful feature that makes Google+ stand out from the social competition is the recommended links feature. 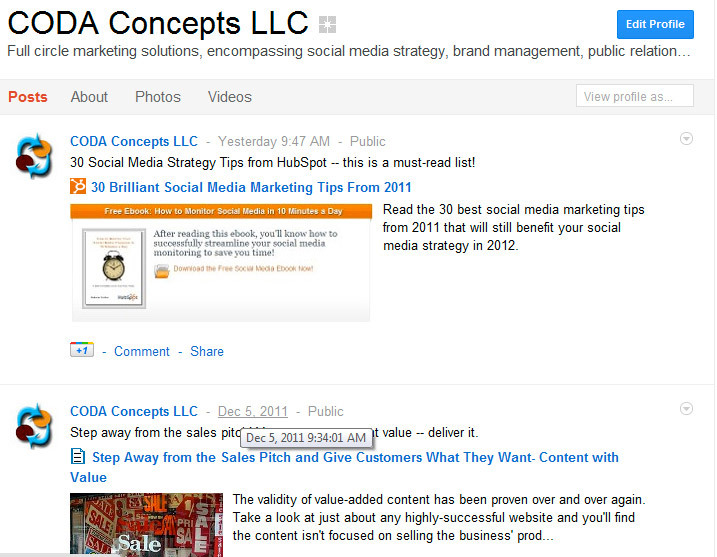 This component, available under the “About” section on a Google+ brand page, allows you to add important links directing users to relevant pages on your website. It’s a useful way to encourage click-throughs to landing pages or helpful articles. Yet another standout feature of Google+ is the hangouts option. This is a powerful tool for videoconferencing, holding meetings, solving customer service concerns and even hosting group chats or workshops. Another plus: You can see who was present after the event, so you can provide targeted follow-ups to current or prospective customers. 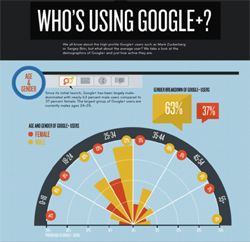 Nearly all good things come with a catch, and Google+ is no exception. Similar to Facebook, the biggest challenge users encounter is building a network of followers. That said, finding your audience can be tough because Pages can’t add individuals to circles without the individual user adding the page first. In other words, the individual audience members must find you first, before you can engage them. The solution? Promote your Google+ page as often as you can on your other social networks and through your website and blog. And make sure current followers in your network are sharing your content. Add other relevant pages to your circles. Invite current business contacts to add your brand page. Offer an exclusive deal to new prospects who add your page. There’s no turn-key solution to develop an audience on any social network, but those who leverage their other marketing expertise and channels will have the greatest success on Google+. The best thing about Google+ is its connection to the Google search engine. Google, which has long been the holy grail of SEO, is using information and statistics obtained from Google+ to affect search results. So using the platform to the fullest advantage will absolutely benefit your SEO campaign. BONUS – Google+ Infographic: Who’s Using Google Plus? Infographic by TopRank – How do these stats align with your target demographic?